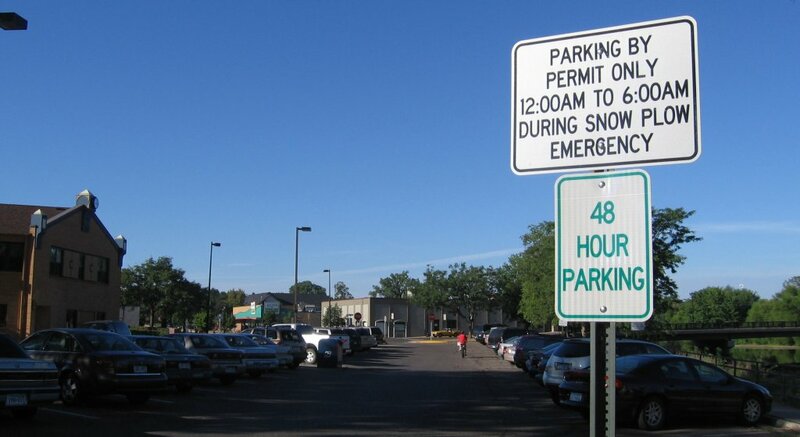 The City recently added ’48 hour parking’ signs to its downtown lots on Water St. (both sides of the river). Downtown residents who park their cars there are now required to drive at least once every two days, making the spaces more available to downtown workers and visitor/shoppers. I’m not sure if this a good idea or not. Thx to Rob Shanilec at By All Means Graphics for the tip. Hmm, that makes purchasing a condo downtown even less appealing. Someone should really take a look at the ownership of the lot on HWY 3 and Water. I am not 100% sure on this, but they may find that is owned by MNDOT, and the city may not have the juristiction that it thinks it has. I know someone that lives in that area, and vanpools. By owning a condo in this area, you think it would come with at least one parking space. The Water Street parking lot rumor that it is not owned by the City of Northfield has been around for some time. We asked about it a few years ago and were assured the City owned the land. I do not think the City of Northfield should be required to “reserve” a parking spot for a condo owner. The developer of a site should have alloted space for at least one parking spot for each condo. When we developed our new building/addition it included three residential units. We have six on site private parking stalls available to tenants and employees of the building. Parking, in my opinion, is still a huge problem in Northfield. I would propose that if Mendota Homes does not develop the former Byzentine corner soon, the City of Northfield should look at aquireing the lot for a new municipal parking area that is well lit and well signed. Downtown residents who park their cars there are now required to drive at least once every two days, making the spaces more available to downtown workers and visitor/shoppers. I have no problem with the above, except there are several businesses in this area that take far too much advantage. An example I have seen is one business, that has some side parking, that still parks his many company vehicles in the lot overnight, as well as in the yellow zone in front of his business. He puts multiple vehicles in the yellow zone as if it is his own personal “delivery vehicle only” zone. No Parking means No Parking. I didn’t see an exception, or a sign stating “Delivery Vehicles Only:” at any time I have been down there. There needs to be a balance between residents, businesses, as well as customers. Maybe the city should have a couple of the spots reserved, and sold by permit only, so that if the residents really wanted the spot, they could reserve it for a fee? I agree as well, that off street parking should be available for the residents, but alas, the area is just too tight on the riverfront. Businesses are very concentrated in this area, and there is a real shortage of parking. If there were a better crosswalk on HWY 3, maybe folks could park over there, and get safely across? I guess this would make it City owned. Couple of remarks about these recent comments. Anyway, to get to the Byzantine site ‘s future parking, one would achieve this by traversing the lot in the photo – and proceeding around the north curve that for now stops at the SMAQ driveway. As to John’s remarks about aggressive personal parking all over the location – it is indeed flagrant… needs a lot of yellow paint and cop work… and the delivery vehicles parking where ever… are only part of the misuse. Look down the drive between the Barber Shop and the Pizza biz or walk down the River Walk Handicapped path – past the private garbage enclosure on city property and you’ll see derelict cars parked back there, in part on the property owner’s side of the line and in part on the City owned side of the line, and weeds everywhere. I find that far more unsightly along our River Walk, much more inappropriate than the Construction Trailer parked on private property, serving the construction site. As to the parking and the related appeal of purchasing a condo downtown… In the building now complete… and for the second building as well. the developer is providing inside underground parking for tenants and some guest as well ( The Guest thing someone might check) and on this entire commercial site there’s considerable public parking. Your guests have as good a chance there as they would in any DT location. Kiffi’s comments are very accurate re: the South Water Streets parking lot/street issues. At one point just prior to entering the parking area a contractor began to paint yellow, no parking curbs. The city stopped them and then proceeded to sand blast off the little that had already been painted. Parking in the lot is a mess…The lot is poorly designed with the small center island that serves no purpose other than holding a light pole. Even a City snow plow driver commented that it was just one more obstacle to hit with the blade. Quite often I hear complaints from customers asking where are people suppose to park? This is during the day when often it is not bad. During evening meal and social times the lot is absolutely packed. As far as the delivery trucks go. The other option the trucks have would be to park on the shoulder of 3 and cart the goods across the parking lot. I’ve seen it done but it does not seem to be a very safe idea. Delivery trucks blocking areas is a daily occurance all along the downtown streets. It is a necessary event. Now with the addition of a couple more restaurants the same trucks will be in town longer. I do not see this as too much of a problem. The drivers try to deliver the loads early in the day. Every store or shop that sells product needs to get it to them be it by UPS/USP or truck freight. Re:access to the former Byzantine site. It is going to be hard for development of the site with limited access, At one point Mendota Homes had a mock up of a building with an entrance to underground parking on the East corner of the lot. The only problem was that they would have to use the SMSQ access to get to it. At the time I am sure they did not have an agreement with the property owner to cross… It is going to be interesting whatever gets developed there. Anyway,,,,just my 2 pennies worth. You know, I have such mixed reactions when I hear about the Great Parking Problem in Northfield….to Kurt’s point, this is more of an issue along Water St., especially since the lot holds fewer cars now than it did before the “improvements”. However, I have never, ever had to park more than a block from anywhere I needed to go downtown, except during DJJD. It seems that we’ve become accustomed to being within 50 feet of where we want to go or we think there’s a problem. And sometimes it’s a matter of perspective. I came out of my office a couple of weeks ago and whined to myself that I had parked all the way in the back row of the municipal lot… then I realized that if I had come out of any door in Chicago and seen how close my car was, I’d think the parking gods were smiling on me. And I’m pretty sure the Menards parking lot puts a lot of people at least two city blocks from the door. Yo Tracy – I don’t feel that this thread as initially Posted by Griif goes to “Additional Parking” which by the way while you don’t see it as a necessity today – I’d hope you, as a Planning Commissioner, would be on the cutting edge of sorting out future needs, and realizing the dearth of available sites to meet future NEEDED DT parking… would be proactive and provide [in some way] for those DT needs… today. Ya know, like planning. Back to the initial posting – I’d ask of Griff is this, in his opinion, a Posting of substance? I digress. What happened here is the new improved 48 hour limit question raised in the Post was morphed by follow-up dialogue regarding parking on the West Bank and related improprieties. I commented (viewed here as Kiffi’s remark – my error) with some of the real facts which seemed to be begged by virtue of some written misunderstanding. The issue at hand on the West Side Water Street area is not so much “quantity of Parking – as it is about parking abuses. Which by the way, may be in-part a result of too few parking spaces. Arguably, the delivery cars would be parked all over the area… as close as possible to the Pizza front door, no matter how many spaces were available within a block’s walk. So, maybe the parking mess (you define it) is not about spaces but abuses, so… yellow paint and cop action, right? How does this fit the 48 hour limit? Seems to me Griff’s closing thought is simply trying to pose a “problem” to get some LG action for LG self serving reasons. 48 hours is not a good TV program and in N’fld it isn’t an issue. Had LG been at Council meetings when staff brought this relatively insignificant “housekeeping” idea to the Council… LG could have blown it out of proportion then. Now, mama… it’s a done deal. As to “time limits in monopolizing one parking stall” – they [the stalls] are public and should rotate on a reasonable schedule. I’d also offer this: City Staff did present this to the NDDC before it went to the Council. That leadership gave it an affirmative nod. I agree with Tracy in reguards to distance. In the mornings I could easily drive (or stop) for a cup of coffee but I prefer the walk across the river and to fetch the java….My wife parks four block from work in St. Paul and thinks its a great location very seldom regretting the distance from car to office. Victors thoughts are very good that as we “plan” or perhaps hope for future development the issue of parking for the entire downtown should be considered. It seems that there has been a lot of downtown events this year that involved shutting down streets and allowing more pedestrian uses of the area. If we want to continue to promote activites like this then we need ample parking. Years ago when my wife and I checked into the St. James (Red Wing?) hotel the front desk person offered to valet park our car to an off site lot. They said it freed up a lot of downtown parking in near the hotel. When we wanted our car we called the front desk and it was waiting for us. All this for no additional charge….what a great idea. I am not in any way saying local business’ should start valet services. My thoughts are that they were using off site, out of the way lots to help deter parking issues. I probably won’t make many friends saying this, but we might consider charging for parking. Don’t guillotine me too quickly! I’ve checked out the following book from the Carleton library and will reading it furtively! When to charge and when not to charge? Would what works in a big city work here? Off-street parking requirements are devastating American cities. So says Donald Shoup in this no-holds-barred treatise on the way parking should be. Free parking, Shoup argues, has contributed to auto dependence, rapid urban sprawl, extravagant energy use, and a host of other problems. Planners mandate free parking to alleviate congestion, but end up distorting transportation choices, debasing urban design, damaging the economy, and degrading the environment. Ubiquitous free parking helps explain why our cities sprawl on a scale fit more for cars than for people, and why American motor vehicles now consume one-eighth of the world’s total oil production. But it doesn’t have to be this way. Shoup proposes new ways for cities to regulate parking, namely, charge fair market prices for curb parking, use the resulting revenue to pay for services in the neighborhoods that generate it, and remove zoning requirements for off-street parking. Such measures, according to the Yale-trained economist and UCLA planning professor, will make parking easier and driving less necessary. Yes, developers should provide the parking not the city. Parking decks actually can be not so bad. See Red Wing’s parking deck. I didn’t know it was there the first few times I drove downtown. Charging for parking – I’d advocate charging for parking along the street but make the deck free. Seems to contradict my previous statement but really it doesn’t. I just sorta changed my tune in realizing it’s not the city that owes a resident a parking space but the condo itself. Cheers from the North Shore. Cynthia – very interesting – charge for On Street Parking – while Ramp parking is free. Seems like such a program would stimulate short stays on the street, and for the cost conscious… keep the convenient DT spaces rotating… encouraging more use a few blocks away of the free ramp! Meters selling parking in 15 minute increments of time. No limit just feed the meter at $2.00 per hour. There’s another side to the coin you tossed. Those nice parking ramps that you saw in Red Wing are all designed, built, and paid for by the government. It’s how the public sector supports the private sector in cooperative projects in that community and is probably considered part of their economic development strategy. I discussed an affordable housing project with the folks in Red Wing some years ago and they literally told me to have my architect submit the plans for the building to their engineers and they would design, build, and pay for the parking underneath our building. It’s also how Red Wing works to attract developers, “We’ll take care of your parking challenge”, and shapes the built environment in that community, “We’ll design that parking ramp to meet our standards”. Furthermore, those wonderful interior block public parking structures that the City has created are shared by multiple businesses. I believe that this is a more efficient use of land resources in meeting parking needs. Finally, Bill, you can probably guess how downtown retailers would respond to charging for parking. Consumers could plug the downtown meters with quarters or go park in the massive lots out on the highway for free. Another challenge to shopping locally. I guess as long as there’s a drop of oil left in the world, people are going to want to drive and park their cars. I have been paying attention to the lot on South Water a even a little closer lately. I noticed during the day the parking has been pretty good (available) but in the late afternoon and evening the lot is packed to overflow status. The other night even the corner Mendota Homes property had a dozen cars in it. 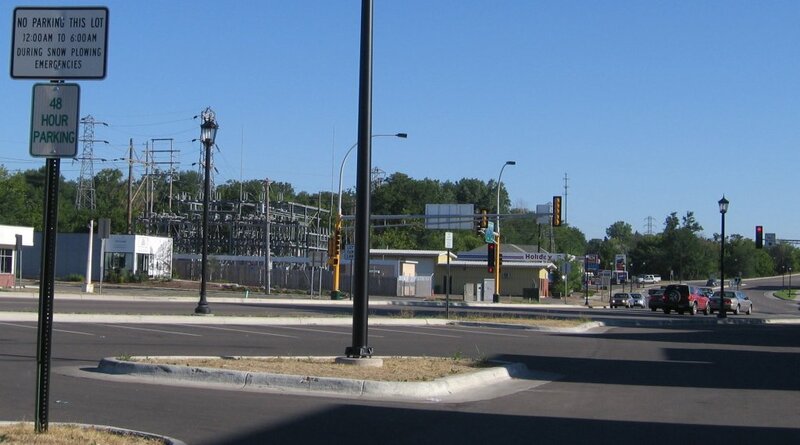 As Northfield is developed the infrastructure needs to be in place. Trying to add it later would be a mistake. This would include parking areas. What seems like the edge of the business district today will more than likely not be tomorrow. Also, by the time one gets to that intersection they have already seen a lot of “welcome to Northfield” sights that are probably not what we would like. My whole point is that if you want to people to park in the downtown business district of tomorrow than we should be planning for it today. Heres a infrastructure related question. What are peoples thoughts on the push for the Woodley Street repair/replace project??? Kurt, if I ever get caught up, I’m planning a new blog post on the Woodley project, so let’s hold conversation on that and keep this thread downtown parking-oriented.